Recommended for two-wheelers with a low risk of theft. 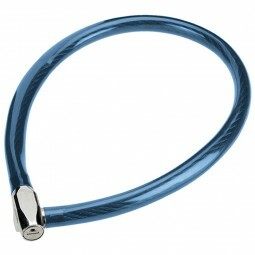 Can be used as a secondary lock (front wheel, saddle) next to a U-lock for example. Attach the two-wheeler to a fixed object (e.g. lamppost, road sign, fence). Self-explaining, easy handling through automatic cylinder. Colours Vay Vary (black, red, grey, blue).